Today's projects were inspired by the So Tweet set of art stamps designed by Shelley of Singlestone Studios! The So Tweet set is much more mod in styling then the Butterfly Garden set I showed you a post ago. SO the projects it inspired in me have a totally different look than the accordion book. The first project I did was this clipboard. I used papers that Shelley designed, then ripped them, painted over them, and continued to layer them. The colors of these papers are purple, yellow, chartreuse, and pink and all very very tweet. After layering the papers and paint I added some stamps from the Tweet set. I love the birds and flowers. The little birdhouse stamp is adorable as well. Then I stamped tweet all over and then to finish added rub-on's from memory makers (Chloe's Closet). I love the way you can mix and match the text stamps in this set. Shelley included words like "home", "tweet", "shower", "your so", "baby","our new nest", and "thanks so much". In the birdhouse piece I used the home and tweet stamps but other combo's include "your so tweet", "tweet so much", "tweet shower", "tweet baby", "home- our new nest", and "baby- your so tweet" the applications are endless. In fact, all the images are scaled just right to really mix and match everything.The tree was a blast to work with and I think stamping a little line of trees- and adding elements to show the change of seasons would be sooo fun. Did I mention I LOVE the versatility of this set? I love the way all the projects I did turned out. My favorite however, is the birdhouse. To create this piece I first glued on torn pieces from an old french-english dictionary I found. Then I painted over the entire piece, adding more or less as I wanted the pages to show through. After this I set it aside and played with the stamps. I used Sculpey and pressed the tulip stamp into it then cut apart the stem from the flower and baked them seperately. That way I was able to paint them red or green with more ease. Plus, when I glued them to the birdhouse I was able to position the flower heads at different angles for a slightly more natural and engaging look. TIP= When I cut out around the image prior to stamping I left a little border all the way around the image. That gave me the raised outline on all the finished images. SO CUTE!!!! After gluing on the clay pieces I stamped on the bird on the roof,the text, and the butterflies using my ink pads. The leaves of the branch I stamped on with acrylic. The doodling was all done with a black wax pencil. Then I went back over the entire piece with more white and added some purple paint to highlight- which I then brushed right over with a bit more white to blend it in to the rest of the piece. Finally, I used my black wax pencil to doodle in the butterflies' flight pattern and to add a few more finishing details. I'm really lovin' how cute it is. By the way, should you want to make your own birdhouse, I purchased the wood form complete with the little fence out front, from my nearby JoAnn Etc. for under $5 bucks! For more information and actual images of the stamps I used check out www.singlestonestudios.blogspot.com. 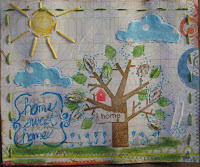 Shelley has been posting sneak peeks all week along with photos of projects created by the other design team members. So go and check it out to see all the cool frames, tags, and super trendy cards YOU could make with this set!!! The sets will be available for purchase April 1st!